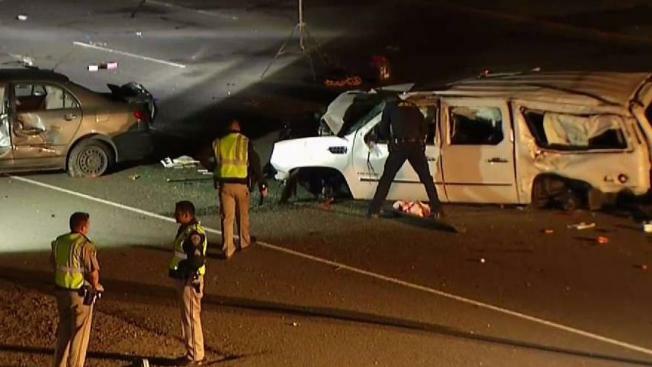 Three people were killed late Tuesday night in a five-vehicle crash that closed all lanes of northbound Interstate 880 in Fremont, and officials say the driver suspected of causing the wreck was under the influence of marijuana. Three people died at the scene, and five others, including a child in critical condition, were rushed to hospitals, California Highway Patrol officials said. The three people who died have been identified as Noelle Johnson, 39, 14-year-old Christy Limas and 9-year-old Brooke Limas, all of Manteca. The driver, identified as 21-year-old Dang Nguyen Hai Tran of San Jose, was not injured and has been arrested on suspicion of driving under the influence of marijuana, according to the CHP. The Manteca Unified School District said the two children who died attend Brock Elliott Elementary School and Sierra High School. "We encourage families to be especially sensitive and prepared to offer support to their children during this time. District staff inclusive of additional counselors will be on site to offer support throughout the week," the MUSD said in a statement. All northbound lanes reopened just after 6 a.m. on Wednesday. Three people were killed late Tuesday night in a multi-car crash that closed all lanes of northbound Interstate 880 in Fremont, and officials say the driver suspected of causing the wreck was under the influence of marijuana. Bob Redell reports. Tran was booked into Santa Rita jail early Wednesday, and $195,000 was set for bail. He's due in court for arraignment on Thursday.